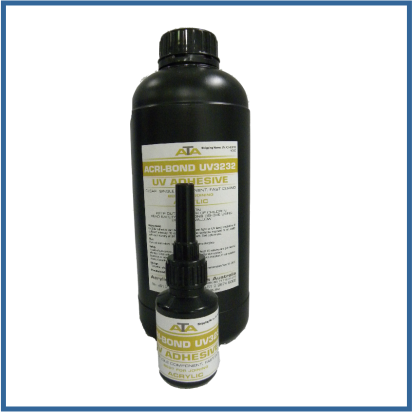 ACRI-BOND UV2046 – UV LIGHT CURING ADHESIVE MED VISCOSITY: 60±10 (CPS@25℃) is developed for use in bonding a variety of plastic such as ABS, PC, PS, PVC and Acrylics. 1.00 Lit sealed bottles are available in carton of 4 or 6 bottles too. 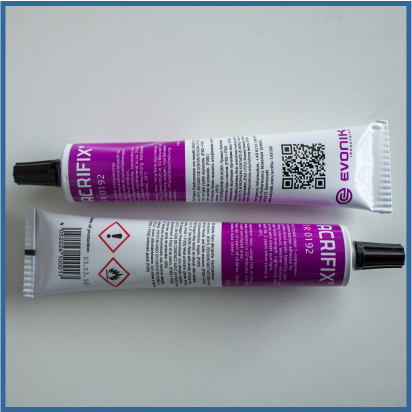 Other UV adhesives and packaging sizes (100ml, 250ml and 4.0 Lit) are available on project request basis. 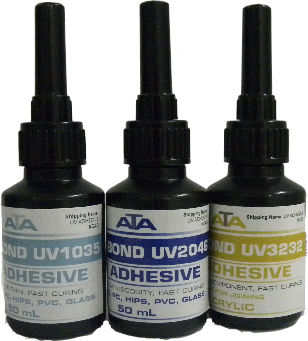 ACRI-BOND range of UV curable adhesives represents a new dimension in light curing technology. 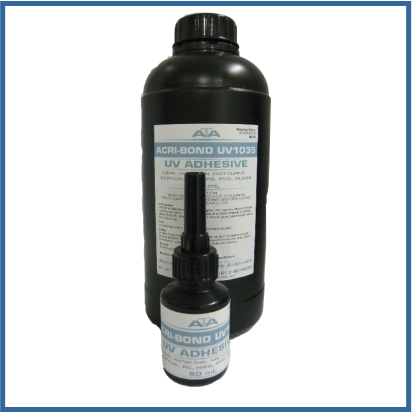 The UV adhesives are solvent free, containing only reactive components. A highly cross-linked polymeric matrix results on curing without evaporation or the elimination of volatiles. 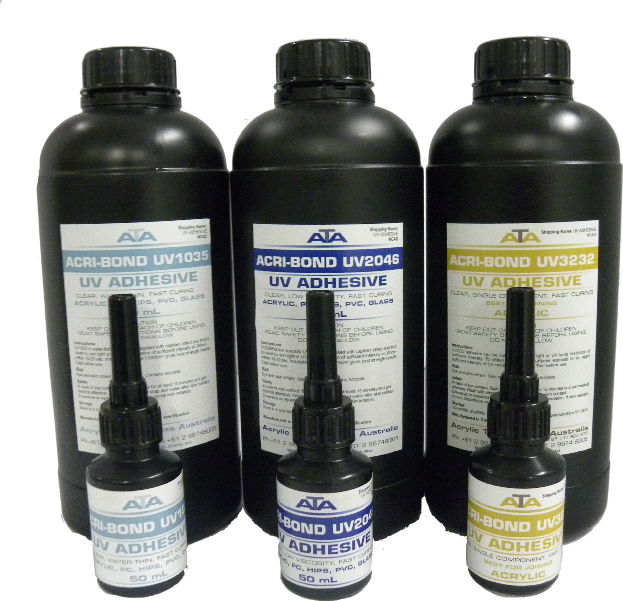 All UV adhesives are 100% reactive systems and were developed to sharpen and maintain the end-user's competitive edge through cost effective parts processing. Feature: High toughness. Not degumming and cracking after cycle test of high or low temperature. 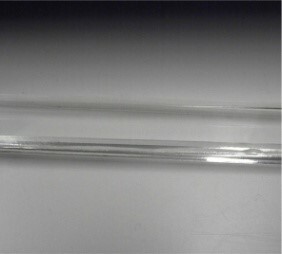 Crystal clear, bubble free joint cures best after exposure to about 15-20 sec of high intensity UV light (see our UV equipment page). It will cure on natural sun light after about 30 sec too. 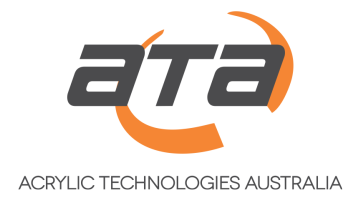 ATA Pty Ltd selected 3 products (Low, Medium and High viscosity) that will cater for most applications in Plastics Fabrications industry. 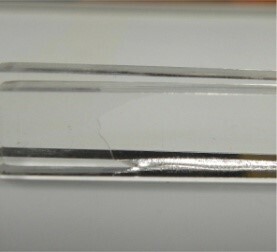 So, you may apply it with capillary effect (Low and Medium) with needle or directly from black tubes. 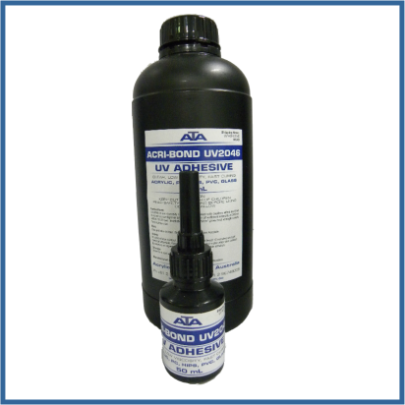 ATA UV adhesives (Medium to High viscosity) are with good gap filling properties so it can be used on saw cut acrylic as well. 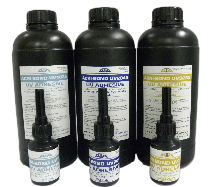 It is safe for use over laser cut or diamond polished surfaces as it will not craze. Please test properties and curing speed before use. 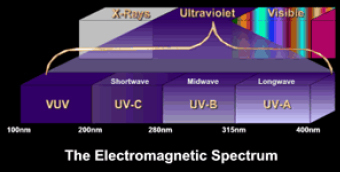 While "black lights" do produce light in the UV range, their spectrum is confined to the long-wave UVA region. 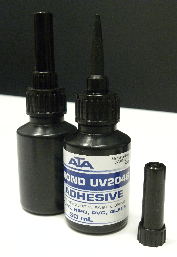 UV hand held devices supplied by ATA Pty Ltd are selected to provide UVA light at 365 nm required for our adhesives cure process. 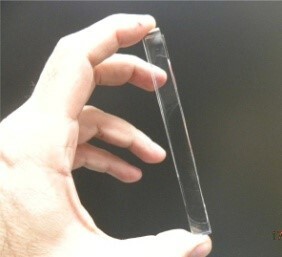 UVA is considered the safest of the three spectra of UV light. It is the higher energy (short-wave) light in the UVB and UVC range that is responsible for the DNA damage that leads to skin cancer. 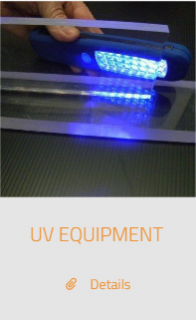 UVA light is much lower in energy and does not cause sunburn. UVA is capable of causing damage to collagen fibers, so it does have the potential to accelerate skin aging and cause wrinkles. UVA can also destroy vitamin A in the skin. UVA light can cause DNA damage, but not directly like UVB and UVC. Due to its longer wavelength, it is absorbed less and reaches deeper skin layers (the leather skin), where it produces reactive chemical intermediates, such as hydroxyl and oxygen radicals, which in turn can damage DNA and result in a high risk of melanoma. 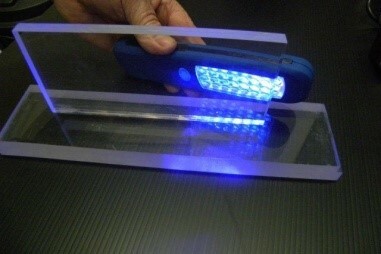 The weak output of black lights, though, should not cause DNA damage or cellular mutations the way sunlight can, although there are reports stating that the type of UV radiation used for suntan (UVA) can cause DNA damage, photo-aging (damage to the skin from chronic exposure to sunlight) and skin cancer as well as toughening of the skin, suppression of the immune system, and cataract formation after overexposure.